A closer look at the bascule spans on the Spanish River Boulevard Bridges. I spent some time trying to understand the purpose of the blue box on the right side of the photo. I finally decided it must be a counterweight for the right bascule leaf. As the counterweights rotate downward between the white concrete sides of the piers the bascule leafs are raised into the air. 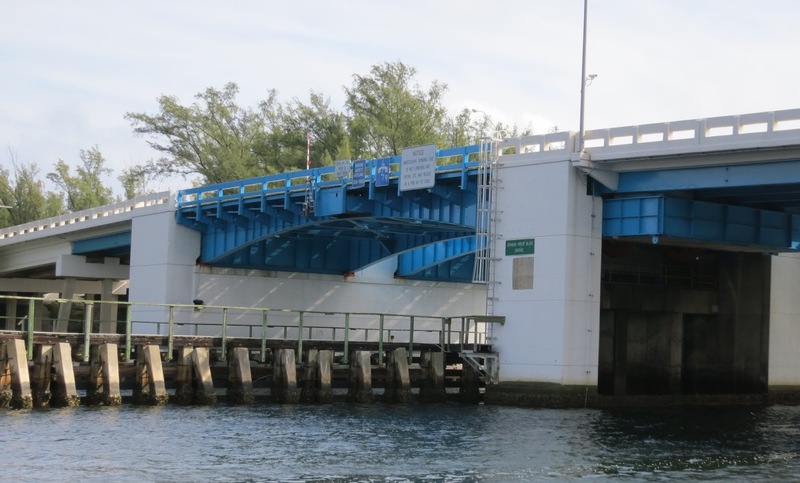 Palm Beach County, Florida Bridges: Spanish River Blvd. Bridges across the Intracoastal Waterway (2) by Mark Yashinsky is licensed under a Creative Commons Attribution-NonCommercial-ShareAlike 3.0 United States License.